Vivid Sydney is back for 2019. The annual festival of light, music and ideas takes place from 24 May - 15 June and we have a range of fun things to do during the festival. See the best of Vivid with Adrenaline experiences like the Harbour Bridge Climb, boat cruises and Luna Park entry. Vivid Sydney has gone from strength to strength since it began in 2008, and its 11th year is looking bigger and better than ever, with a varied and interesting program of events. There are things going on all over the city, but naturally, it’s the lights that attract most of the attention. Thankfully, there are plenty of ways to see them in style. 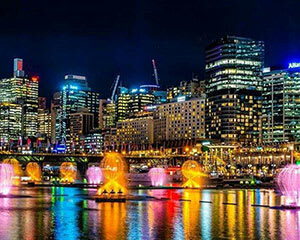 Starting 24 May, the city will be lit up from 6pm each evening, with stunning displays to make some of Sydney’s most iconic sights look even more impressive. 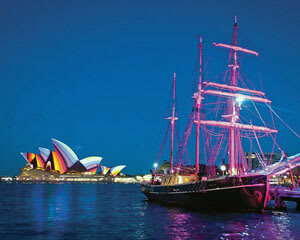 This year, the Sydney Opera House sails will feature projected artwork by LA-based artist Andrew Thomas Huang. The colourful display of moving digital sculptures takes inspiration from the native flora of Australia. Take a look through our Vivid range to find the perfect activity for you. 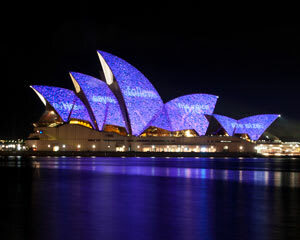 What’s the best view of Vivid? To get the ultimate views of Vivid, why not try the top of Sydney Harbour Bridge? The BridgeClimb experience is popular day and night throughout the year, and during Vivid it offers an amazing vantage point to see the visuals displays. On your way up you’ll climb the arch on the Opera House side, giving you the perfect view of the displays stretching from The Rocks, around Circular Quay and through the Botanic Gardens. You’ll be able to take home a souvenir photo from your climb, and during Vivid there’s even a neon dancefloor (disco style!) at the summit of the bridge, so you can celebrate your achievement and show off your dance moves if you like! Vivid is also taking in Darling Harbour (a great place to grab food and drink after your climb) and you’ll cross over to that side of the bridge for the descent back to the climb base. 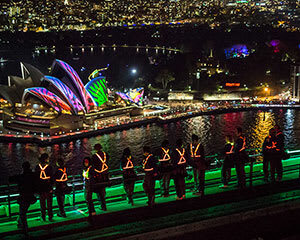 Why not tick this bucket list experience off your list during Vivid 2019? Sydney Harbour boat cruises are an ever-popular choice for Vivid visitors. There are all kinds of cruise options to choose from, suitable for a range of budgets, running during the week and on weekends. You can enjoy a memorable journey on a Tall Ship Dinner Cruise, which offers you a tasty dinner and drinks on the water, along with spectacular views. Of course, you might prefer to just take in the views without the extras. 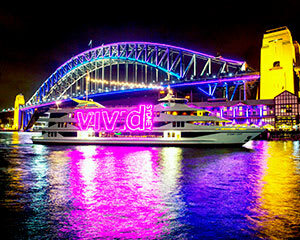 How about the spending an hour on the Vivid Sydney Lights Evening Cruise? This will take you past the Harbour’s best displays, while you sit back, relax and enjoy. Just be sure to take your mobile phone or camera along to take some snaps, as there are some seriously impressive photo opportunities. 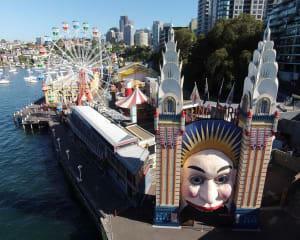 The Vivid fun continues north of the bridge at Luna Park. 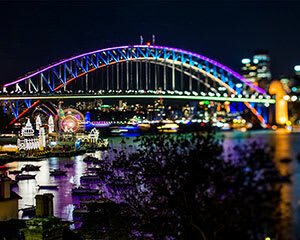 The historic Sydney theme park, at Milsons Point, has its very own light projections on its Coney Island ride, celebrating the park’s history in a colourful way. There'll also be street performers in LED-lit outfits walking around the park to add to the celebratory atmosphere. Make the very most out of your visit, with the unlimited rides pass. Ride as many times as you like on the park’s newest ride Volaré, which opened in March, as well as long-time favourites like the Tango Train, Devil’s Drop and the Hair Raiser.